On a recent visit to the Paige Academy preschool in the Dorchester neighborhood of Boston, a group of students sit clustered on the rug in front of teacher Sister Paige. Sister Paige leads the students in counting up to 10, with the whole class yelling the even numbers and whispering the odd ones. After a follow-up activity with puzzle shapes, she transitions the group to centers. In one small group children play with letters, picking out the ones in their names. In another, four kids “read” picture books. Sister Paige spends part of the time on a stool observing the children and taking notes on index cards. Around the corner in another room, Sister Vishali flashes paper plates with different numbers of dots on them as the children in her class “click photos” in their minds, trying to instantaneously identify the number of dots (see photo above). The students are doing an activity of the Building Blocks math curriculum in which students practice “subitizing,” instantly judging the number of items in a set. Subitizing is an important skill that supports composing and decomposing numbers in later years. Following a routine with which they are clearly familiar, small groups of students bound up to get in line for the restroom when they hear the letter that begins their name. Near Sister Vishali is a large posted sheet of chart paper outlining the schedule of small group centers for the day for both her class and Sister Paige’s. Sister Paige’s and Sister Vishali’s classrooms are two of 14 community-based preschool classrooms participating in Boston K1DS, a project to implement the school district’s prekindergarten model in community-based programs. Boston’s prekindergarten model has recently been found to lead to the biggest gains in vocabulary and math of any large-scale program in the United States to date and smaller but significant gains in executive function skills as well. As a result it has been profiled in Time Magazine, the Christian Science Monitor, and Education Week. These findings feature prominently in a recent summary of the U.S. evidence base on preschool outcomes as an example of a highly effective combination of a “developmentally focused” curriculum and intensive coaching. The Boston K1DS project is thus a novel collaboration in which a school district works hand-in-hand with community-based providers to implement a proven, developmentally-appropriate curricular approach to improving child learning. EEC Commissioner Tom Weber touring the Boys and Girls Clubs of Dorchester with Vice President of Programming, Mary Kinsella. Boston K1DS is a collaboration between the Boston Public Schools (BPS), Thrive in 5 (Boston’s early childhood collaborative), the MA EEC, and private funders (see here for the complete list). This collaboration is a more expensive initiative than the other Birth-Third Alignment Partnerships in the state, drawing on Boston’s larger pool of resources. Boston and Thrive in 5 each received $200,000 grants from EEC (over two years). The Barr Foundation is the primary funder of the project, Boston Public Schools is contributing funding as well, and Thrive in 5 is raising additional funds. The project includes a formal evaluation by a Harvard research team. Importantly, BPS and the other partners have committed to expanding the project to include additional community-based preschools if the project yields results comparable to the outcomes in BPS classrooms. Further, most of the lead teachers are receiving an increase in salary to compensate them for their participation in the project and to promote teacher retention. After first describing the BPS prekindergarten model and the context of the project, I describe the components of the K1DS project in more detail. The Boston preschool model has its roots in a 2006 decision by Boston Mayor Thomas Menino to expand prekindergarten in Boston elementary schools and to develop an early childhood department to support the improvement of prekindergarten and kindergarten teaching and learning. Prekindergarten for four-year-olds in Boston is referred to as K1 and kindergarten as K2. Early in his tenure as early childhood director, Jason Sachs undertook an assessment of prekindergarten teaching and learning using the ECCERs, CLASS, and ELLCO tools, all of which are observation-based measures of classroom quality. This assessment identified the need to improve quality. As a result of this finding, Sachs and his expanded team began development of a K1 curricular model. The model they developed is anchored by an integrated curriculum composed of the Opening the World of Learning (OWL) curriculum for literacy and the Building Blocks curriculum for math. K1 teachers were supported in implementing this curriculum with professional development, an integrated scope and sequence, a binder of detailed materials, extensive coaching, and professional development on Making Learning Visible, an approach to observing and documenting student learning. Meanwhile, numerous elementary schools underwent NAEYC accreditation during the years in which the K1 model was being implemented. Of 79 elementary schools, 22 are currently accredited and 41 either are receiving or have received accreditation support. The early childhood department continued to assess quality in K1 classrooms using classroom observation tools, conducting regular audits by outside experts to inform the provision of coaching and professional development support. The above-mentioned Harvard evaluation found that the K1 model was implemented with a high degree of fidelity (over 70%) and that it led to the groundbreaking gains in student learning mentioned above. Sachs attributes the success of the K1 model to (1) its “laser-focus” on a developmentally appropriate, effective curriculum supported by intensive coaching and professional development, (2) a well-compensated teaching staff all of whom have bachelor’s degrees, and (3) the impact of the NAEYC accreditation process. Getting ready to paint at the Boys and Girls Clubs of Dorchester. Interest in supporting community-based preschool to implement the BPS K1 model predates the EEC Alignment Partnership grant. 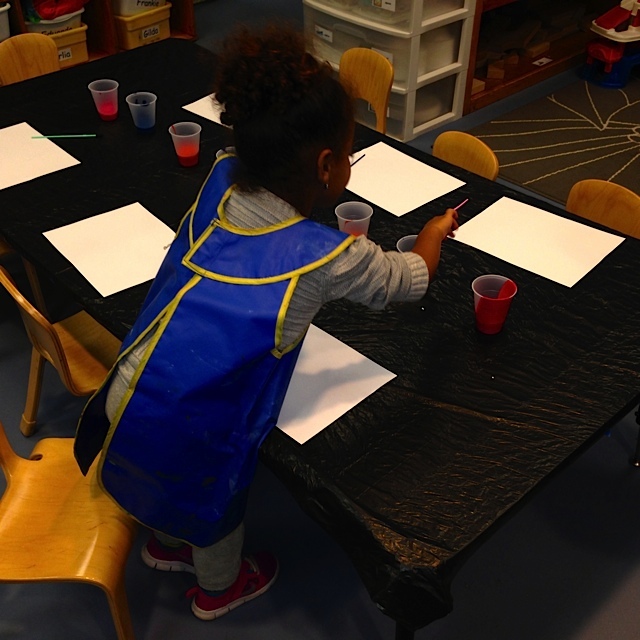 One early education program, the Boys and Girls Clubs of Dorchester, had already begun implementing the model in one of its preschool classrooms. The demand for K1 seats by families in Boston is high, and BPS has been running out of room to expand K1 classrooms in its elementary schools. 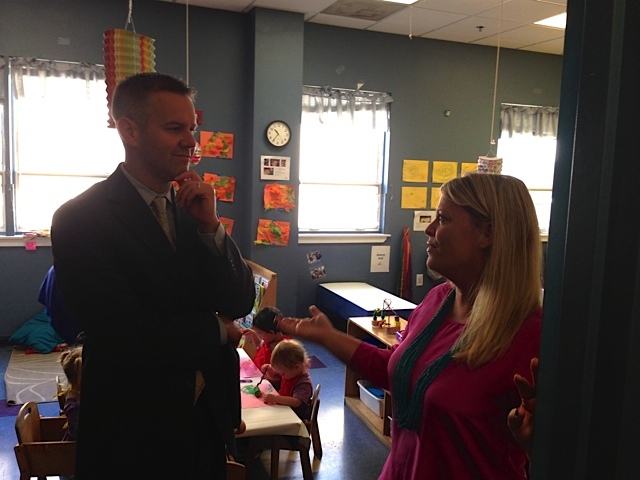 Further, the creation of BPS’s K1 program created competition for community-based preschools. Parents have incentives to move their 4-year olds into a K1 if they get into a school of choice in order to secure a place, leaving fewer 4-year olds in community-based preschools. Community-based preschools provide full-day, full-year care for families. In the neighborhoods targeted by Boston K1DS, most families rely on vouchers from the state to cover the cost of preschool, and full-day, full-year care is a resource many families need. Community-based providers argue that the loss of 4-year olds makes it harder for them to maintain their enrollments and cover the cost of serving younger children. This tension is part of the context in which the collaboration between BPS and community-based providers is taking place, a tension that plays out in other EEC Alignment Partnerships as well. The EEC Birth to Grade Three Alignment Partnership grant created an opportunity for BPS to collaborate with Thrive in 5, a partnership encouraged by the EEC, the Barr Foundation, and other funders. From Thrive in 5’s perspective, Boston K1DS supports its long-term vision of creating a pipeline of programs that are prepared to become community-based K1s. This project supports Thrive in 5’s goal of aligning child experiences, teacher professional development, and assessment tools across community-based and BPS programs. Thrive in 5 aims to develop a replicable model, a clearly defined product, married to the QRIS system that can be widely adopted to improve community-based preschool quality while garnering the financial support of funders. Education, lead teacher: minimum BA degree, with 4-6 courses in early childhood education and three years of EC teaching experience. Assistant teacher: minimum AA in early childhood or CDA, and one year of teaching experience. At least 80% of enrolled children must be Boston residents. The Early Childhood Department conducted site visits and identified programs that would participate in the project, yielding 9 K1DS classrooms in addition to the already-implementing Boys and Girls Clubs of Dorchester classroom. Thrive in 5 identified an additional four classrooms for a total of 14. At this juncture the lead teachers in the BPS 10 classrooms are receiving a compensation increase for their participation; due to the initial funding constraints of the grant, the Thrive in 5 classrooms are not. BPS and Thrive in 5 are currently attempting to raise money for the teachers supported by Thrive in 5 as well. See here for a list of participating programs. Beginning last spring, participating teachers were provided with instructional materials, and BPS held whole group professional development in the integrated BPS K1 OWL and Building Blocks curricula. In addition to the whole group workshops, BPS coaches provide customized on-site support to all the teachers, a crucial component of the project’s support structure. Concurrently, BPS and Thrive in 5 are holding monthly meetings for the directors of the participating early education and care programs. These meetings also play a critical role in the project. They serve as a forum for administrative decision-making, coordination, and problem-solving, and in addition BPS has used them to showcase BPS and non-profit resources that are available to the community-based programs. The directors have expressly requested using meeting time to focus on curriculum fidelity, which is seen by K1DS leaders as an indication of the directors’ commitment to the project. As is the case in Somerville and Springfield, the directors meetings have led to the development of trust and stronger relationships and “spillover” collaboration beyond the scope of the K1DS project. BPS has developed an effective, developmentally-appropriate prekindergarten curriculum. The district has also developed the internal capacity—a coaching staff—that supports well-compensated, educated teachers in implementing this curriculum. Boston K1DS is a pilot to determine if the model, in conjunction with a compensation boost, can be implemented in community-based classrooms with similar results. Future posts will explore the implementation of the K1 curriculum, the perspectives of participating teachers and directors, coaching practices, and other aspects of the K1DS project. All the adults at Paige Academy are referred to as Sister and Brother and their first name. I’m appalled after reading the first two paragraphs that this is now what gets celebrated as quality early childhood education. Are there no materials and meaningful reasons to count in our classrooms that we have to use glorified flash cards (dots on plates) and rote drilling, all in the service of the narrowest definition of math skills? Is this what the BPS is doing to unique programs like the Paige Academy that used to have an independent vision and soul? Am I supposed to be happy that we’re now teaching to the test in our four year old programs? What happened to engaging children’s minds in meaningful projects and activities where counting is merely one tool for children to use as they explore and make sense of their world? What happened to play? When will Harvard stop being a party to this and remember what pioneers like Eleanor Duckworth taught us? There is much to be said for the approach Boston is taking on bringing income equity and professional development to community-based programs. But can’t we be more careful about what we hold up as great experiences for young children. Shame on us all, if we’ve drunk the Kool-aid.